We've lived in our home for a little over 9 years, and during our years here, we've never focused on creating a proper dining room. Over the years, we've had plans and saved to redo the room, but there has always been some other expense that has come up that prevented us from following through. When Raymour & Flanigan contacted me to work with them to do a dining room makeover, I was thrilled...to say the least. My dream of having a dining room would finally be realized, and I couldn't have been happier to work with a brand with a great reputation for fabulous furniture and unparalleled customer service. This week we put the finishing touches on the final dining room. I can't wait to share the reveal with you next week, but before I do, I wanted to give you a peek at and some back story of the room prior to the makeover. We have used this room for many purposes over the years from a TV room for the kids to a playroom to an office. Yes. It has more or less been used for just about everything. We've used it for family celebrations, at times renting tables and chairs to accommodate our guests. 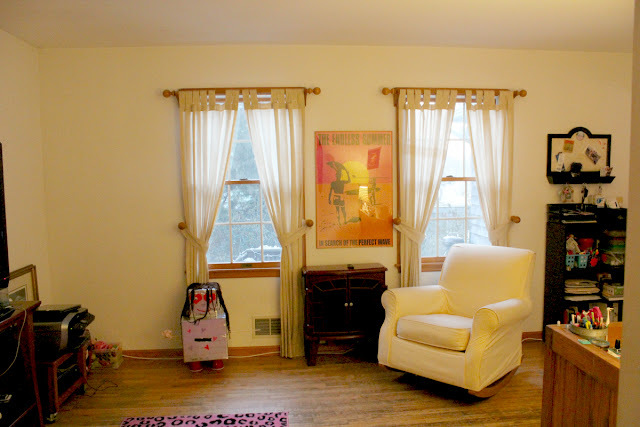 Just prior to the makeover, it was used as an office/kids' entertaining room. As the girls watched TV, I tried to be productive. Cat toys found a permanent home in the room as did a random bookshelf. Actually, the entire room was full of random pieces of furniture. From the desk to a rocking chair to the bookshelf to a sewing table given to me by my mother, nothing matched, and there was no uniformity to any of the items. This photo shows the only wall in the room with windows. 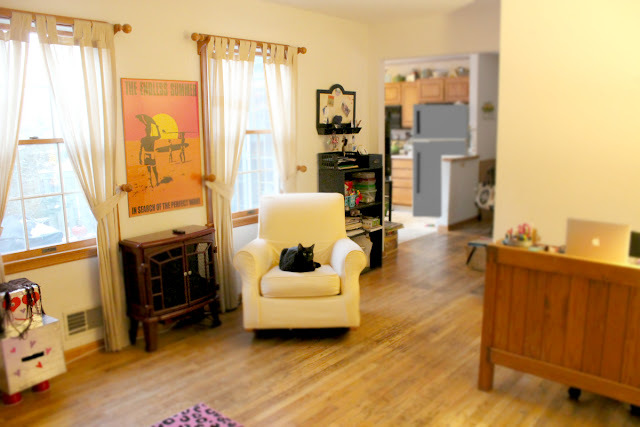 As you can see, here's all that mismatched and random furniture I was talking about. 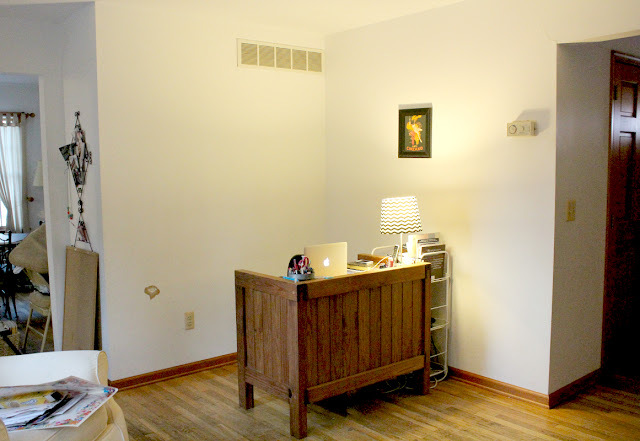 A rocking chair, a bookshelf, a desk, a printer cart. Nothing matches, and as I look at this picture, I realize that this room became a place for everything that wasn't quite appropriate for any other room in the house. This is a shot of the left wall in the room. 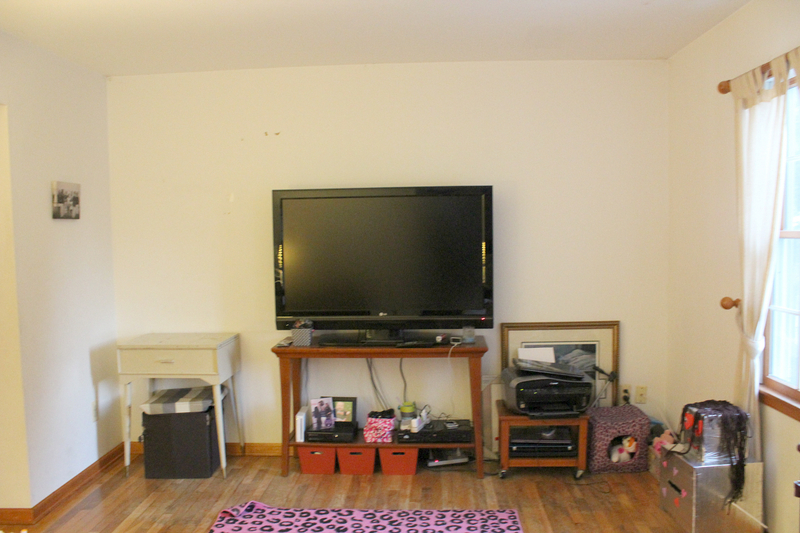 More random tables, an oversized TV, the printer cart, cat toys, a storage ottoman, and a sewing table. And let's not forget the purple and black leopard print rug, which at one time was in one of the girls' bedrooms but somehow made its way into this room. How's that for random?? In the opposite corner sits my desk. It's obvious that the artwork is underwhelming and very small for the wall space. As you can see from this picture, there are two ways to enter and exit the room, which also poses a few challenges when decorating this space. The doorway to the right leads to a short hallway that extends to our front door and from which you can access the powder room on the left. 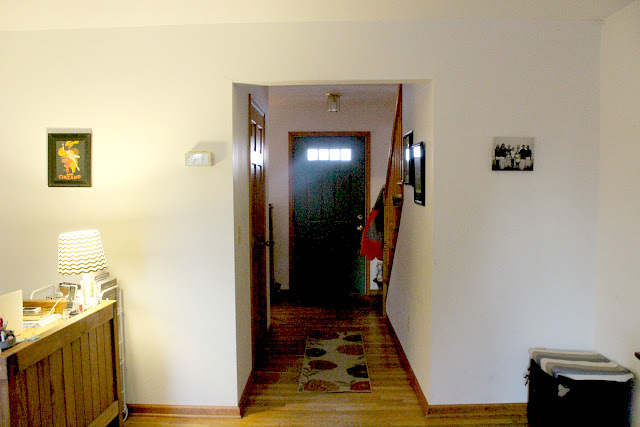 The larger archway to the left leads to our kitchen and eating area. It's obvious how neglected this room was and how it became a dumping ground for odd pieces of furniture, school projects and papers, craft supplies, and all other odds and ends that we weren't using on a daily basis. When we entertained, we would move the existing furniture around and bring in a folding table and chairs which we keep stored in the garage. It worked in a pinch, but it was hardly ideal and was probably the reason why we cut back on entertaining. It was a lot of effort to convert the space to a temporary dining area, and it wasn't the most attractive space when we did so. Today, we have a gorgeous dining room with ample seating for all of our guests and all the amenities for proper entertaining. We can't wait for the upcoming holiday season to show off the room to our friends and family. 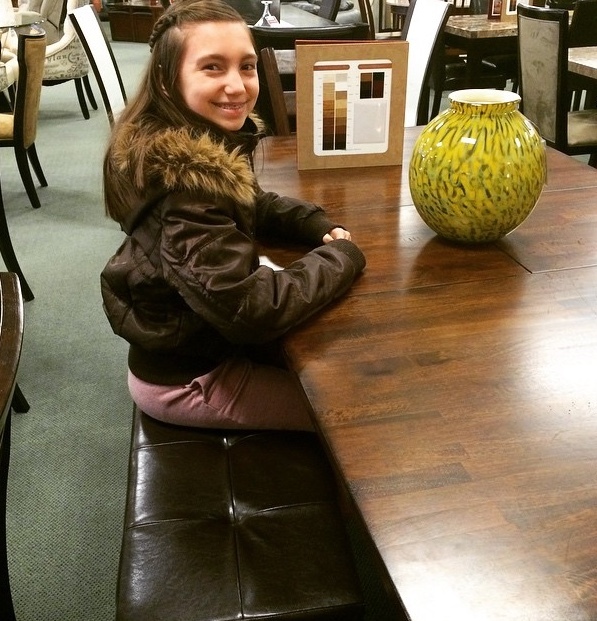 We had such fun shopping for the new furniture. We tried just about every dining set in the showroom until we were absolutely smitten with "the one". Which one was "the one"? Well, we were torn between 3 different sets. We didn't want a set that was too formal since our home is casual chic. We wanted something that was on the contemporary side without being too edgy. We narrowed our final selections down to these three sets. Which one did we choose? Can you guess? Leave a comment and let me know which one you think we chose. Tune in on Monday, September 14, when we REVEAL our new dining room compliments of Raymour & Flanigan Furniture!